For C935 and X945e, Yield: For each, up to 47,000 pages at approximately 5 pages/job usage. 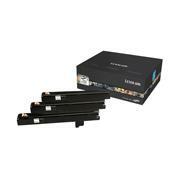 For X940e, Yield: For each, up to 44,000 pages at approximately 5 pages/job usage. Contains 3 units.